The Action Center for Transformation (ACT) aims to build a Rural Community Library & Resource Center in each village or urban slum. The goal of such libraries is to increase literacy and cultivate a habit of reading and writing among children. The organisation recognizes that a non-government organization (NGO) with the aim of improving communities should not just focus on healthcare. A holistic approach should be adopted which means covering areas from healthcare, employment opportunities to education. ACT works with commercial organizations to set up these libraries in urban slums and in turn, help these companies achieve their corporate social responsibility goals. Commercial organizations can contribute by donating a sum of money which will go into building the library and purchasing items needed to operate the library. The books, computers and furniture such as computer desks and shelves are also donated by individuals and other organizations. The library will provide books from fiction to non-fiction, teaching materials and books for specialized examinations. It will also have amenities such as computers so that these children will no longer have to travel for hours to a place to acquire computer skills, a long journey most of them cannot afford and discouraging for children to learn computer skills. 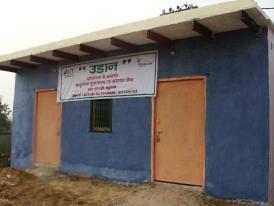 The library in Bandhwari Village will begin in January 2013 and is supported by Interglobe Technologies. While ACT is in charge of setting up the library, the daily operations will be run by people selected from the village. By selecting people to run the library from the village, this creates a sense of ownership and encourages the community to take responsibility of the center. The library in Bandhwari Village will be run by a librarian, who will be in charge of organizing and loaning out of the books maintaining the computers and, an operations manager who will be overall in charge of the place. The operations manager will also be in charge of conducting computer lessons and the library’s accounting. The library’s target audiences are not just the children, numbering approximately 60 children from the very young to adolescent youths, but the illiterate women as well. The illiterate women are under the library’s Functional Lifelong Programme, which aims to teach these women basic English through the use of computers. They will be taught by students who are enrolled in the library’s computer lessons. At the same time, the library will be a place for community classes which are currently being held in the courtyard of a villager’s house. It is hoped that such libraries will complement the public and private schools existing in the village and encourage the children to read beyond the school syllabus and be exposed to a wider world of knowledge.